Dubai’s Roads and Transport Authority (RTA) has announced that 83 per cent of the work on Ras Al Khor Street Improvement Project (Ex Al Awir Street) and the upgrade of the entrances of the International City has been completed. The project, which is being completed in co-ordination with the International City main developer Nakheel, had been undertaken as a result of the traffic impact study for International City and Dragon Mart, especially after the expansion of Dragon Mart, and the expected growth of traffic density in the area, it stated. Mattar Al Tayer, the director-general and chairman of the board of executive directors of RTA said: "Phase Two of the project, which is expected to be opened this March, includes improvements on Al Manama Street and widening of the junctions, namely the extension of Al Manama-Al Warsan 1 Street (previously Nouakchott Street), Al Manama Street-Sheikh Mohammed bin Zayed Road, and the International City-Al Manama Streets." "Improvements of junctions also include the construction of bridges and signalised junctions enabling movement in all directions, namely on Al Manama-International City Streets (previously Street 414), Al Manama-Warsan 1 Streets, and Al Manama Street-Sheikh Mohammed bin Zayed Road," stated Al Tayer. 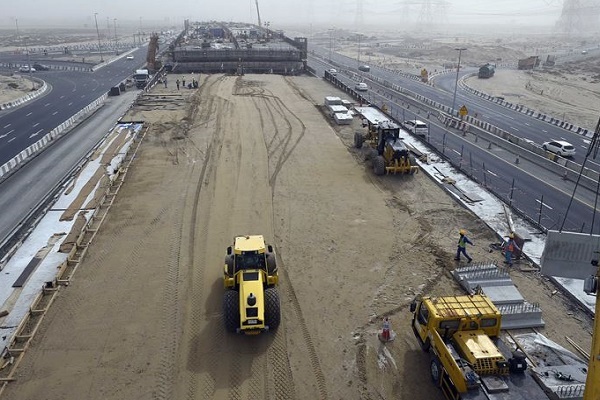 The improvements on Al Manama Street-Sheikh Mohammed bin Zayed Road include widening of the flyover above Sheikh Mohammed bin Zayed Road from three to four lanes in each direction to increase its capacity from 4,500 to 6,000 vehicles per hour., said the RTA statement. It also includes increasing the number of lanes in the sector from Ras Al Khor Street to Sharjah, and from International City to Jebel Ali and Abu Dhabi, from one to two lanes. The step will double the capacity of slipways from 800 to 1,600 vehicles per hour, it stated. Al Manama Street will be widened in the sector between Sheikh Mohammed bin Zayed Road and the entrance of the International City from three to six lanes in each direction. The step will increase the street capacity by 1,500 vehicles per hour per direction. Al Manama Street will be widened in a sector from the entrance of International City up to Sheikh Zayed bin Hamdan Al Nahyan Street from two to five lanes in each direction. These works will increase street capacity from 3,000 vehicles per hour to 7,500 vehicles per hour, said the RTA in its statement. Phase Two also includes the improvement of the junction of Al Manama Street and the entrance of the International City to a signalised junction enabling movement in all directions, and the construction of a flyover of three lanes in each direction, offering free crossing of Al Manama Street. The step will increase the capacity of the street to 4,500 vehicles per hour, it added. RTA said the scope of work includes improvement of the existing surface intersection of Al Manama with Warsan Street 1 (previously Nouakchott Street) to a signalised junction enabling movement in all directions.